Stop throwing the fruits vegetable peels as you may benefit in a lot of ways from them. Nothing goes useless in this world if we use our brain. 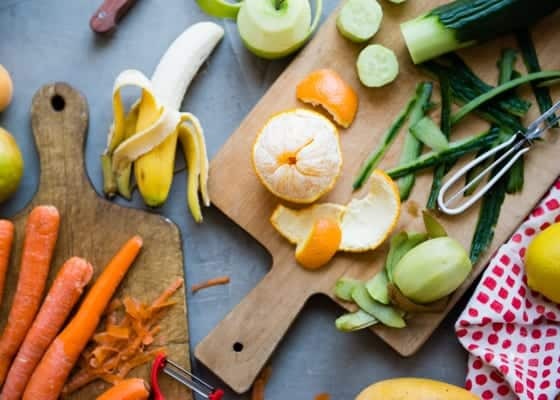 And these peels of fruits and vegetables which we treat as waste even has many uses and we are bringing you some of the brilliant uses of the peels that you may make use of them and make your life easier. The peels of cucumber will help you in getting rid of ants. You can simply place the cucumber peels along the entry point of the ants and as they hate cucumber, it will help you in getting rid of them. Stop investing in dangerous products and harmful chemicals for getting rid of ants. Also read 6 Easy Recipes With Vegetables For Kids – A Happy Mommy Hack! Pomegranate peels work as a great dye material. You can actually get your plain cloth covered with the color of the pomegranate peels and this actually costs you no extra money and is even a simple process. Take a large stainless steel pot and fill it with hot water and add the peels of pomegranate to it, and let it sit for all night. Then heat the water and peels the next day, and remove the peels, add the wet cloth and let the cloth simmer in the water for about one hour and then set it to cool for all night. Remove the cloth and rinse it with cool water and you are done with dying your fabric. Dark circles around the eyes and puffy eye bags may ruin the beauty of your face and may also make you look like an aged person. And you don’t have to go around beauty parlors and spas to get rid of them as potato peels are at your help, you can just place the potato peels around your eyes after putting them in the fridge for about 15 minutes. Lie down for about 20 minutes and see the difference. Orange peels even have many uses that you can use them by dring them out and then make them into a powder by grinding them and then use that powder as a face pack. Or else, you can dry the orange peels. After they are completely dried out, add a few dried pieces into a hot water pot and leave it on the stove for about an hour and serve it warm. And you can also put them in your closet between your clothes as they smell really good, they can transform they fragrance into your clothes. Also read Instant Recipies -To Slow Down Clock In Morning With Taste! Avocado peels actually work rich in moisturizing your skin, just rub the peels of avocado on your skin and then wash out with clean water after a few minutes. An apple a day keeps the doctor away is the saying that we all are very much aware of. Many of us eat apples but by peeling it off, it’s not a good way to eat, you should eat the peels too. If you had that habit of peeling the apple before eating, then don’t throw them away. Frozen the apple peels and then use them while making the smoothie. They will be good for health. So, we hope you never throw these fruits vegetable peels again as you have known the benefits.